2019 Ride Schedule has been Released! At 106 West we want our riders to focus on the adventure while we take care of the little uncertainties that can ruin a trip. This means you can focus on the riding and beautiful views instead of wondering if you’ll have a place to stay and enough gas to get there. With thousands of miles of dirt roads, leading rides in the American West requires more than just knowledge of one route. Knowing alternate routes and the best towns, local history, interesting hikes, diversions and even geology differentiate 106 West tours from other tour companies. More than just a guided motorcycle tour, a ride with 106 West is an opportunity to ride some of the most beautiful, fun roads thru the most beautiful and amazing terrain in the world! For a truly unique adventure riding experience come explore Utah, Colorado and beyond with 106 West Adventure Motorcycle Tours. At 106 West it is about both the journey and the destination. With thousands of miles of fun dirt roads and some of the most amazing vistas in the world, Colorado and Utah offer an adventure riding experience second to none. Endless miles of fun dirt roads winding over mountain passes, past red rock arches, deep canyons and amazing rock formations make a tour with 106 West an unforgettable riding experience. Our reasonably priced tours will take you along seldom ridden back roads to hidden treasures only accessible by those willing to ride off-tarmac. And after a great day of riding you will be guaranteed a hot shower and soft hotel bed. Tour dates are perfectly chosen to make sure you are riding in the best weather and at the best time of year. 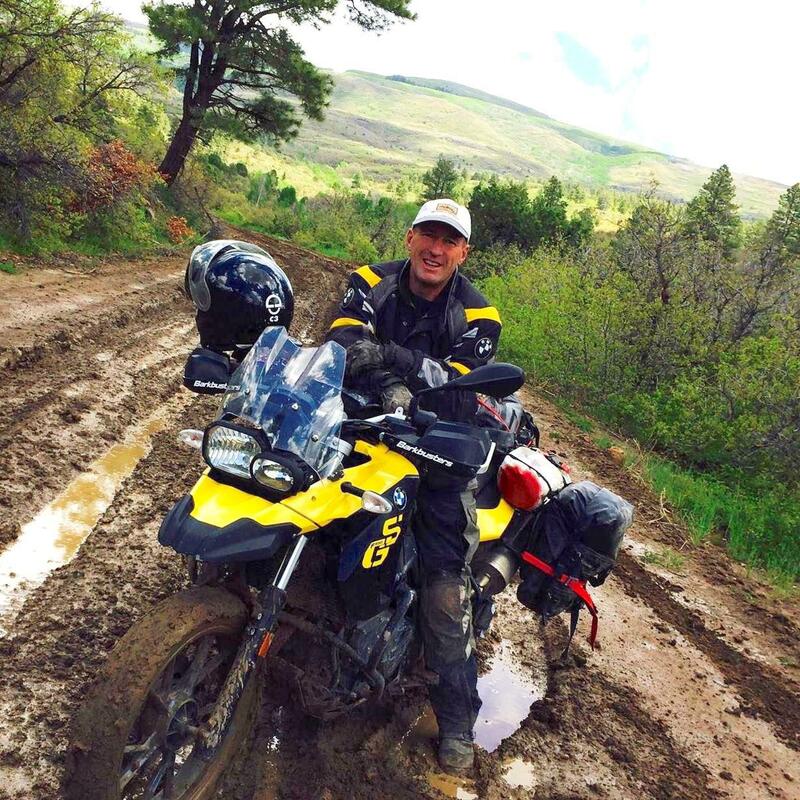 John Hax is the founder and owner of 106 West Adventure Motorcycle Tours. John is a former Marine Officer who has years of experience in backcountry navigation and knows all about the amazing stretches of the country that you’ll be exploring during your tour. John will serve as your travel coordinator and personal guide, helping you navigate rural routes and discover some of the Southwest’s hidden gems along the way. As you travel down winding canyon roads, across mountain streams, and make your way to incredible heights, John will be there to offer his guidance and expertise so that you can get the most out of your adventure and arrive to each designated point safely. Brad Haack is a former rocket scientist lured out of retirement with promises of huge paychecks as a motorcycle tour guide. All joking aside, when Brad was not guiding spacecraft around the planetary objects he was on a motorcycle or mountain bike exploring the back roads of Colorado and Utah. After 25 years of exploring the Rockies and Canyon Country Brad is well prepared to answer any questions you might have about the beautiful country we will travel thru. Ben York is the newest member of the 106 West team. Ben was born in the flatlands of Kansas and started riding dirt bikes at around age 10. In 1997 he hiked the Colorado Trail from Denver to Durango (500 miles) and immediately relocated to the San Juan mountains. While living in Durango he was a raft guide on the Animas river and discovered “motorcycle camping”, before we all agreed to call ourselves adventure riders. We are happy to have Ben's expert knowledge on hand for our tours. Thanks John, your knowledge of the back country is second to none, had an absolute ripper trip! Encourage all my mates to get over there and experience it for them self, as I’ve said it many times photos just don’t do it any justice. Thanks John for a Fantastic trip through Colorado and Utah. The scenery was spectacular, the accommodation was spot on and your knowledge of the backcountry was second to none. You definitely lived up to the 106* West Adventures motto and took the road less traveled, some of the best roads I have had the pleasure to ride a bike on. I highly recommend 106* West Adventures to anyone looking for that little bit extra from there bike tour through the USA.